As a daily walking commuter in the city, I see many people like myself wearing headphones on their way to their destination. I've also noticed an interesting trend—more people are wearing full, outer-ear headsets versus the typical in-ear designs. I attribute this to the improved comfort and sound high-quality outer-ear headphones provide. Phiaton, a company that knows a thing or two about headphone audio reproduction, now offers a high-end model called the Bridge MS 500 ($299). Read on to discover if these headphones are the ones you've been looking for. I have worn and reviewed many different types of headsets, from elaborate in-ear styles to expensive studio quality over-the-ear headphones, and none of them have come close to the comfort of the Bridge MS 500. When I slipped these on my head, it felt like my ears were resting on two pillows. That was my first pleasant surprise. The second was the stunning sound quality that enveloped me. The combination of the MS 500's 40 mm drivers within a dual chamber design and the "Oxygen-free copper" headset cable created awesome audio reproduction. From listening to rock or classical music to playing games and multimedia apps with a dynamic range of music and sound effects, I found the headphone's audio reproduction was truly remarkable. It's something you have to hear for yourself. Speaking of the headset cable, the Bridge MS 500 includes two of them: a standard stereo cable and one with an embedded microphone in a single-button toggle switch. The latter works perfectly with an iPhone, iPod Touch, or iPad to control music or answer incoming calls. And because the cables are cloth-wrapped, they are virtually tangle-free. Phiaton also designed this around-the-ear headset to allow the cable to easily plug into either the left or right side of the headphone, solving the often annoying problem of cables getting in the way of certain shirt or jacket designs. It would have been nice if it included a cable clip to attach to a shirt or lapel to keep the cable from tugging when moving your head, but the ability to attach the cable to either side of the headphones mitigates that need to a certain degree. Phiaton also includes a soft cloth carrying case that holds both the collapsed headset, cables, and a 6.3 mm headphone adapter that rounds out the package. 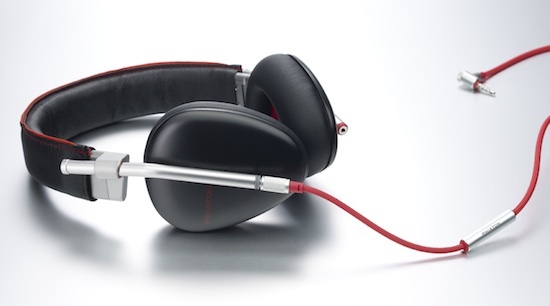 Overall, Phiaton's Bridge MS 500 Headphones exude quality through and through. Materials are top notch and the sound reproduction is the best I've heard from any Phiaton product. If you're looking for one of the best sounding and most comfortable over-the-ear headphones for your iOS device, the Bridge MS 500 should be on the top of your list to consider.